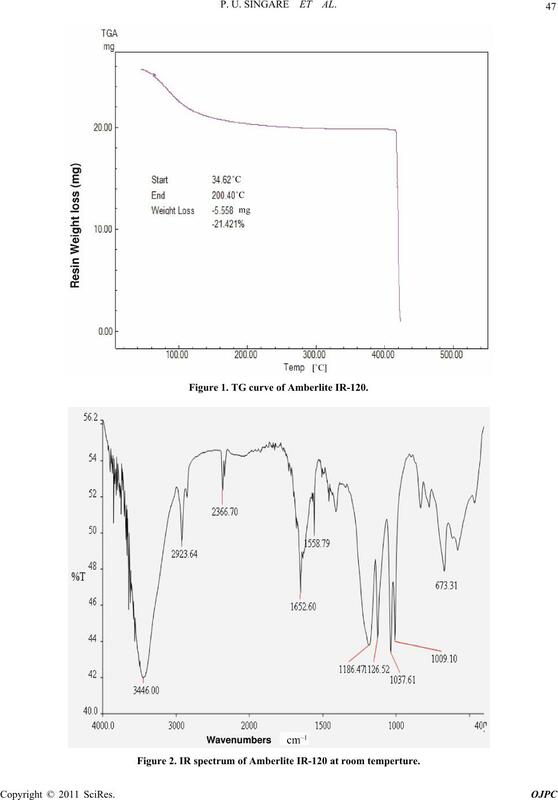 while Amberlite IR-120 cationite get burned off completely. 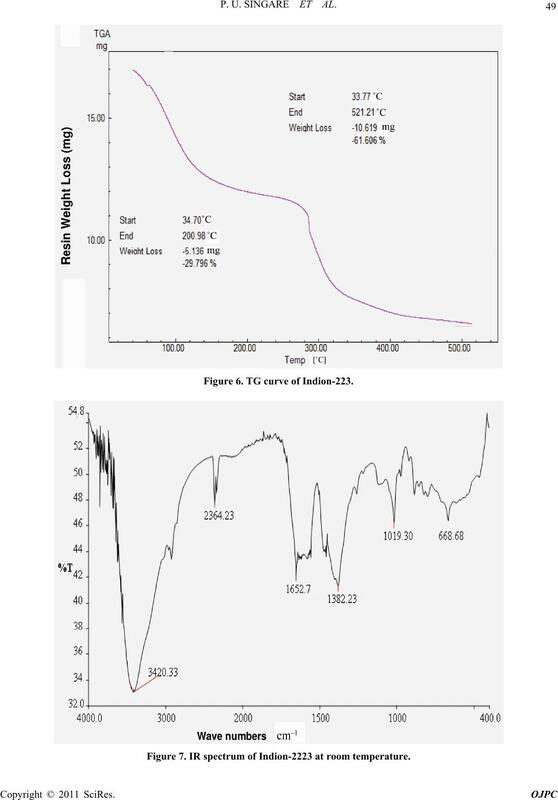 compare the relative thermal stability. Amberlite IR-120 (Rohm and Haas Co, USA). 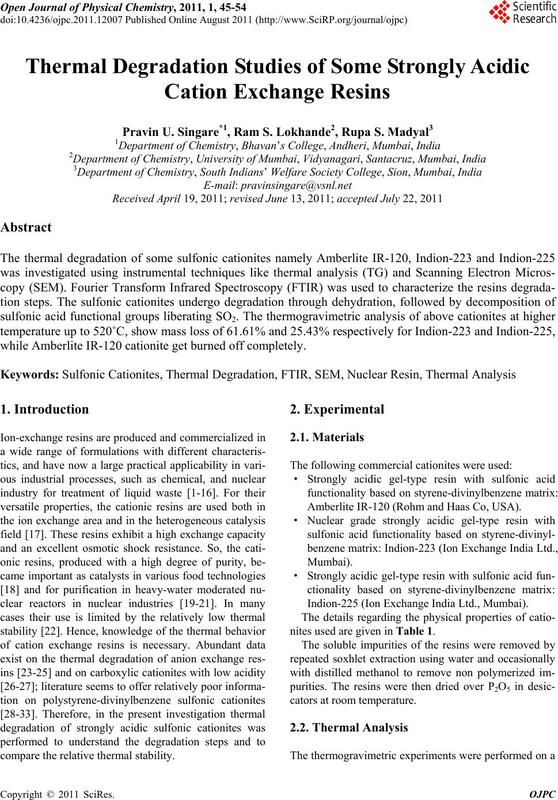 Indion-225 (Ion Exchange India Ltd., Mumbai). nites used are given in Table 1. 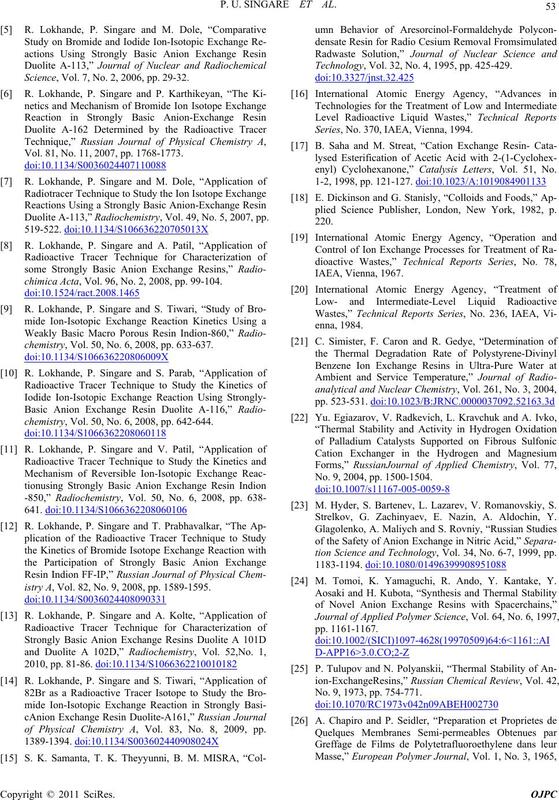 46 P. U. SINGARE ET AL. 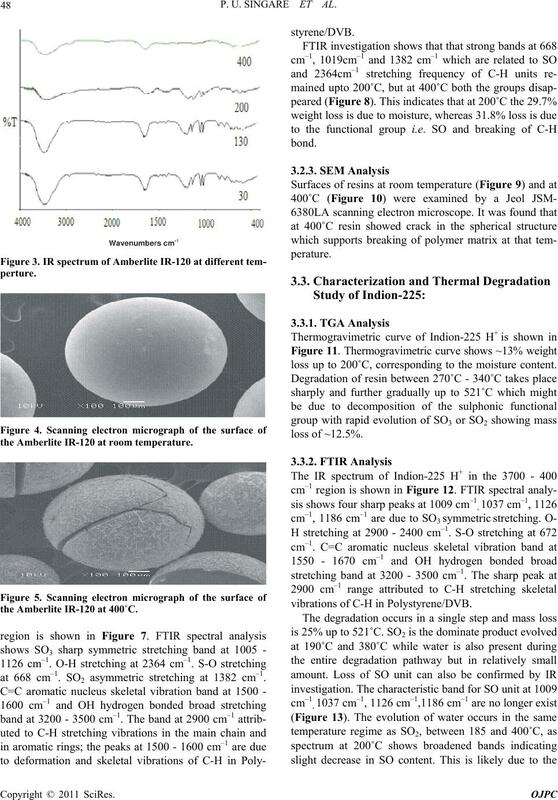 (SEM) were used in addition to thermal analysis. with a thin layer of carbon, for 30 seconds and at 30 W.
15 KV and a magnification of ×100 and ×130. 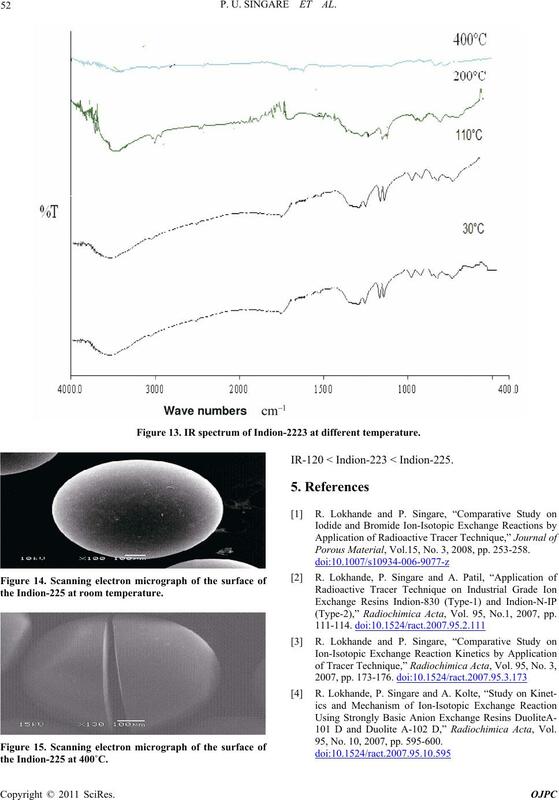 Amberlite IR-120 from room temperature to 550˚C. to deformation and skeletal vibrations of C-H in DVB. O-H stretching vibration originating from the polymer. thread like appearance on the surface (Figure 5). P. U. SINGARE ET AL. Figure 1. 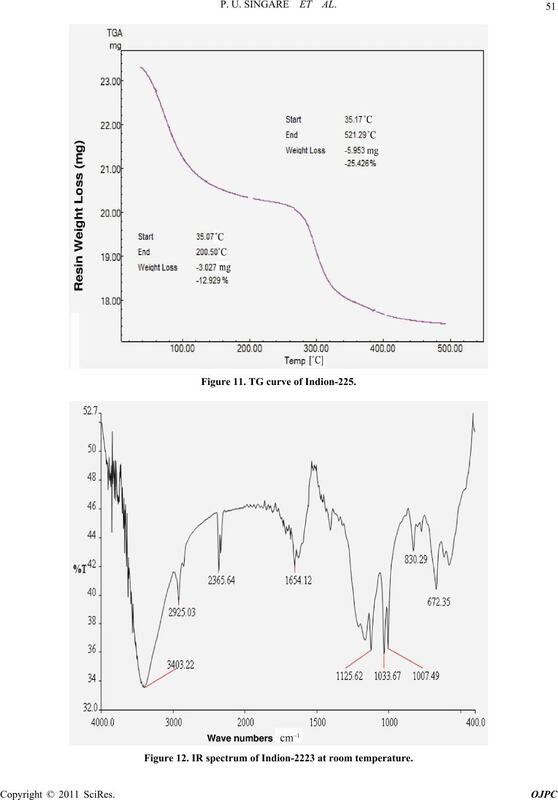 TG curve of Amberlite IR-120. Figure 2. IR spectrum of Amberlite IR-120 at room temperture. the Amberlite IR-120 at room temperature. the Amberlite IR-120 at 400˚C. at 668 cm–1. SO2 asymmetric stretching at 1382 cm–1. loss up to 200˚C, corresponding to the moisture content. vibrations of C-H in Polystyrene/DVB. Figure 6. TG curve of Indion-223. Figure 7. IR spectrum of Indion-2223 at room temperature. 50 P. U. SINGARE ET AL. Figure 8. IR spectrum of Indion-2223 at different temperature. 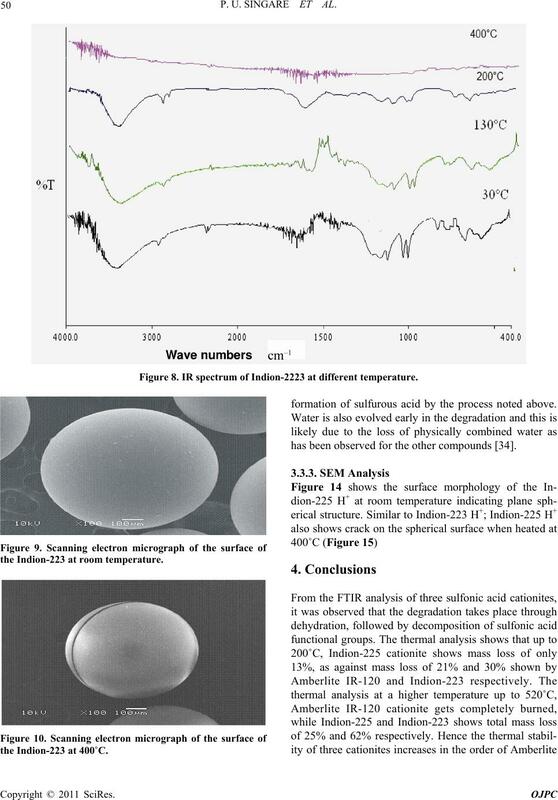 the Indion-223 at room temperature. formation of sulfurous acid by the process noted above. has been observed for the other compounds . Figure 11. TG curve of Indion-225. Figure 12. IR spectrum of Indion-2223 at room temperature. 52 P. U. SINGARE ET AL. Figure 13. IR spectrum of Indion-2223 at different temperature. the Indion-225 at room temperature. IR-120 < Indion-223 < Indion-225. Porous Material, Vol.15, No. 3, 2008, pp. 253-258. (Type-2),” Radiochimica Acta, Vol. 95, No.1, 2007, pp. 101 D and Duolite A-102 D,” Radiochimica Acta, Vol. 95, No. 10, 2007, pp. 595-600. Science, Vol. 7, No. 2, 2006, pp. 29-32. Vol. 81, No. 11, 2007, pp. 1768-1773. Duolite A-113,” Radiochemistry, Vol. 49, No. 5, 2007, pp. chimica Acta, Vol. 96, No. 2, 2008, pp. 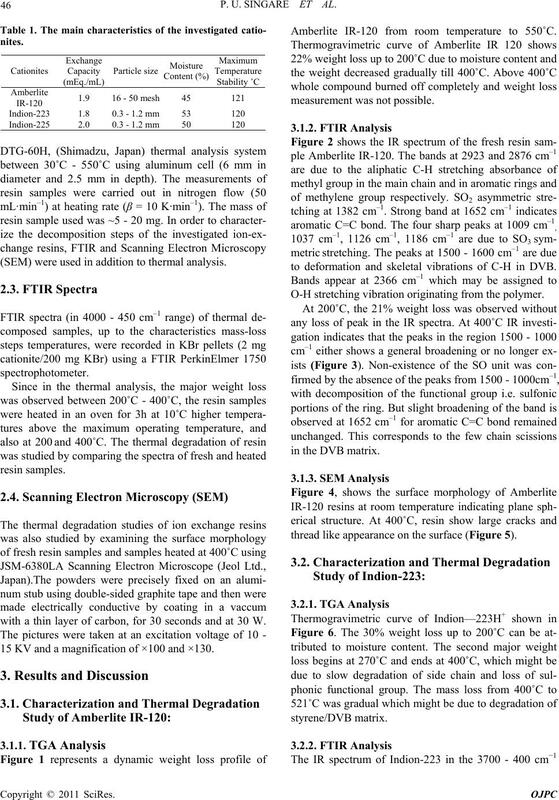 99-104.
chemistry, Vol. 50, No. 6, 2008, pp. 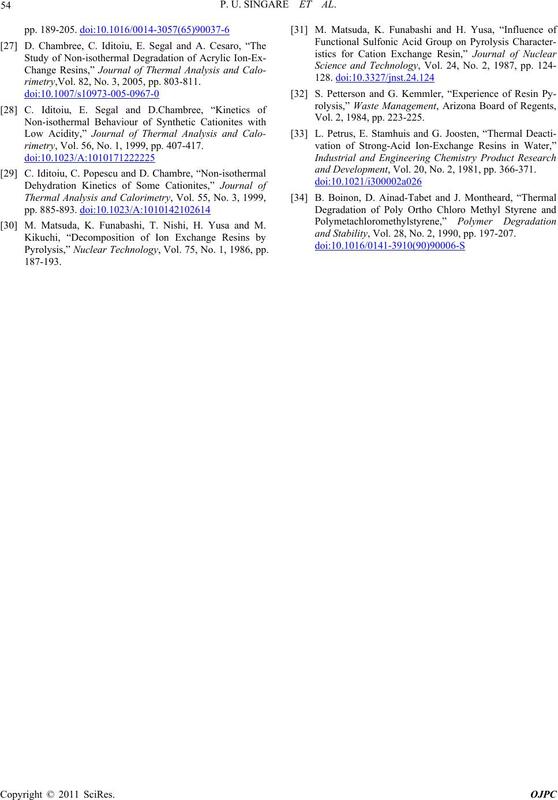 633-637.
chemistry, Vol. 50, No. 6, 2008, pp. 642-644.
istry A, Vol. 82, No. 9, 2008, pp. 1589-1595.
of Physical Chemistry A, Vol. 83, No. 8, 2009, pp. Technology, Vol. 32, No. 4, 1995, pp. 425-429. Series, No. 370, IAEA, Vienna, 1994.
enyl) Cyclohexanone,” Catalysis Letters, Vol. 51, No. plied Science Publisher, London, New York, 1982, p.
No. 9, 2004, pp. 1500-1504. M. Hyder, S. Bartenev, L. Lazarev, V. Romanovskiy, S.
Strelkov, G. Zachinyaev, E. Nazin, A. Aldochin, Y.
tion Science and Technology, Vol. 34, No. 6-7, 1999, pp. M. Tomoi, K. Yamaguchi, R. Ando, Y. Kantake, Y. No. 9, 1973, pp. 754-771.
rimetry,Vol. 82, No. 3, 2005, pp. 803-811.
rimetry, Vol. 56, No. 1, 1999, pp. 407-417. M. Matsuda, K. Funabashi, T. Nishi, H. Yusa and M.
Pyrolysis,” Nuclear Technology, Vol. 75, No. 1, 1986, pp. Vol. 2, 1984, pp. 223-225.
and Development, Vol. 20, No. 2, 1981, pp. 366-371.
and Stability, Vol. 28, No. 2, 1990, pp. 197-207.